We have a new addition in our kitchen–it’s this stool. They had one sort of like it at our local Bed, Bath, and Beyond, but it was shorter than this one–too short, really. This one’s 11 inches tall. The girls have been getting more independent in the kitchen (like J making her own cheesy eggs). I’m all for it. Especially since both of my kids seem to be going through growth spurts and they are eating constantly. They like to cook for themselves, so the fact that our microwave is mounted high above the stove is a major drag. And I know, I know, the microwave isn’t exactly cooking, but give them a break: they’re 7 and 10. I’ll take it. 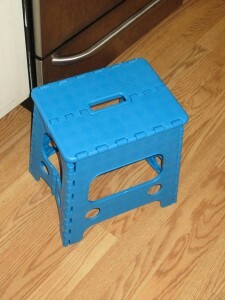 So we bought the stool. The end of summer and beginning of the school year always makes me think about tweaking the upcoming school-time routine, and I’ve been trying to come up with some additional chores for the girls. The whole chore issue is difficult for me–I tend to come up with new initiatives that only work some of the time (you’ve heard this before). The trouble is, enforcing rules is often so much more labor-intensive than just doing everything yourself. Or it feels that way, and it is that way while the family adjusts. After noticing which initiatives have stuck around our house and which have failed miserably, I’ve established rules for myself when it comes to assigning chores. NOT doing something isn’t a chore. There have been times when I’ve tried to crack down on my children’s habitual abandonment of dirty socks and other belongings throughout the house, and any tough-love rules I’ve established end up too emotionally exhausting for me to keep up with them. Instead, I go with the tried and true nagging. In fact, they are so familiar with my nagging that sometimes I’ll say, “Please pick up xyz” and a girl responds, “I know! I know I’m supposed to pick it up! You don’t have to tell me!” Which leads to the oh-so-passive-aggressive, “Sweetheart, if you know what to do, don’t tell me, show me that you know what to do by doing it.” Sometimes I’ll say, “Let’s test if you’re psychic. Look in the dining room and see if you can guess what I’m about to say.” And they prove themselves psychic again and again. During times like these, I like to think about how someday the girls will be doing the same thing to their own children, and they’ll explain all the annoying things that their Mom used to say to them all the time, and their children will roll their eyes, and honestly? It’s touching. It’s like, a beautiful Circle of Life moment that I have with myself. It gives me serenity. TV hardly ever comes free. My children have to ask me before they can watch TV, and my answer is usually, “Sure, but first. . . ” They’re used to this, so it goes smoothly. It would work just as well before a trip to the playground or anything else your child covets. Sometimes I tell them they have to pick up scattered belongings, or set the table, or I’ll set the timer for ten minutes and they’ve have to do some general tidying up. Whatever it is, they are motivated and compliant because they know that whatever I’ve just said “yes” to can turn into a “no” if they aren’t cooperative. Delegate what you hate, but get buy-in. 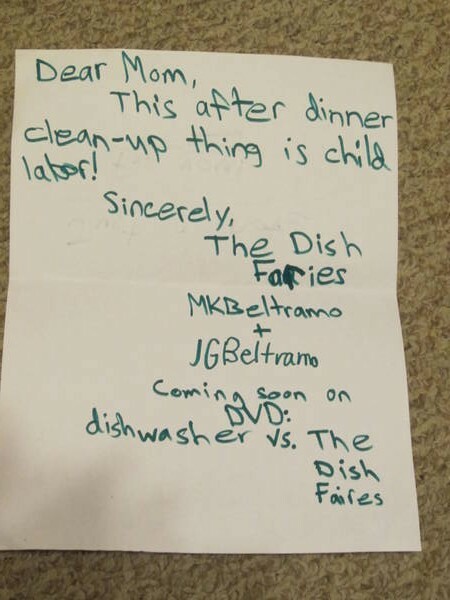 When coming up with possible chores, I like to think about which tasks I’d prefer to skip that my kids might be able to do, and then I let them choose. They feel a bit more in control, and I try to think about what will be peaceful and easy to maintain. Timing is key. 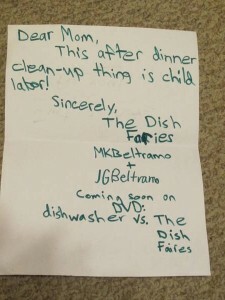 I’ve had some chore failures because I’m just too impatient to wait for my kids to do them sometimes. For example, for a while J was setting the table before dinner. But I’d be rushing to get dinner on the table, or she needed to get ready for an evening activity, and her pace was so slow that it would make me crazy. At the same time M was theoretically in charge of taking out the recycling, but when the recycling piled up and she hadn’t removed it yet, holding back on doing it myself was a struggle. On the other hand, putting away clean laundry works as a chore for them, because if they haven’t put it away, it just piles up in their room and I don’t look at it. Sometimes if I need the empty basket I’ll just dump their clean clothes gently on a chair. Lower standards are also key. If I were a control freak about the organization of my children’s clothing, I’d never be able to handle folding the clothes. When we’re at our in-laws, no one’s supposed to load the dishwasher because no one except my mother-in-law is uniquely qualified to load the dishwasher properly. Me? I’m happy to give up control on some things. It helps that I’m not such a fabulous housekeeper, so my standards are naturally pretty low. Keeping these guidelines in mind, I’ve added a new household task for the girls: they’re in charge of cleaning up after dinner. They were already helping to clear the table, so new duties include putting things into storage containers, scraping dishes and loading the dishwasher, washing dishes, wiping down the tables, and sweeping the floor. They’re motivated to finish because afterwards they read books with Cute W. I’m always tired by the end of dinner, and I aspire to take a quick “serenity” walk with Cute W once the training/transition period is over, so I’m happy to delegate. Meanwhile the girls are glad to use their new stool and do chores that are a bit more grown-up: J loves the idea of washing dishes, and there is satisfaction involved in taking the kitchen from horrible to clean again. It’s not time-sensitive for now–I do have concerns about their other obligations once team practices kick in, but I’m hoping that if we get get into enough of a routine early, they’ll trade off a bit based on who’s doing what. And finally, the dishes occasionally have a bit of schutz left on them, but it’s a small price to pay. How about the rest of you? Any guidelines on what’s worked and what hasn’t when it comes to getting the kids to help around the house? We just recently started a star chart for the girls. The lists are long, but most are elective (save a few that they are expected to do when asked). They range from quick and simple (such as emptying the compost) to lengthy and involved (tidying the playroom) plus a few stretches (like vacuuming) for when they REALLY want to beef up the star count. C’s are simpler and include a general ‘be helpful’ to cover what isn’t specifically on her list (give cats food, put away shoes, clean up doll house, etc). Every 5 stars is worth $1. The first week, we barely had enough stars to pay out anything, but by the 3rd week, we were up closer to $6 (plus some birthday money). They also have the option of counting their stars and delaying payment until they add up to a substantial enough amount. I’m hoping that this system will work two-fold – to get them to help out a bit more, and to help them (specifically my oldest) understand that a $20 toy is equal to kind of a lot of work. (Might make her better understand, too, why I was so annoyed that she lost a $10 bill recently….) Makes yard sales more fun, too, since their money goes further there, and they don’t beg for me to but everything they see. @Claire, I’m impressed that you’ve held out for 4 years! It’s so much easier to get something done when they’re planted in front of the tv. . . .
@Michelle, it’s great that the chart is working for you. We had some great results with chart sort of stuff for quite a while. My kids both like to hoard their money, and it’s funny b/c they’ll ask for something, they need it desperately, and I always say, well, I can front you the money if you want to pay me back when we get home. And suddenly they don’t need it, after all!